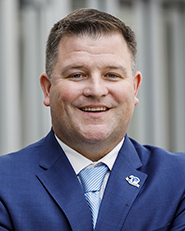 LTC(R) Bryan Price, Ph.D., has been appointed Executive Director of Seton Hall University's new Buccino Leadership Institute, a first-of-its-kind interdisciplinary undergraduate leadership program. Price is the recipient the Legion of Merit, two Bronze Stars, three Meritorious Service Medals and two Air Medals. "Leadership is 100 percent a necessary skill set," said Price. "Our world is so complex but also so integrated that we need leaders in all types of disciplines. This is one of the unique aspects that this program brings to bear. It's those light bulb moments when we might be talking about an aspect of leadership in diplomacy and where that nursing student will say, 'Wait a second. I can apply that concept in my own realm.' That's where the magic is already happening." He added, "The concept of leadership can sometimes be intimidating to people, particularly to younger people. If they don't necessarily have some special skill or superpower in academics or on an athletic field, they feel that they can't be a leader. That's one of the things we're trying to dispel with our program. Are leaders born or are they made? Just as with other traits, some people are born with leadership capability, but I also know that a capability can be taught and developed in all of us."